Gossner College was established in November, 1971 by our Founder Principal Rt. Reverend Dr. Nirmal Minz. 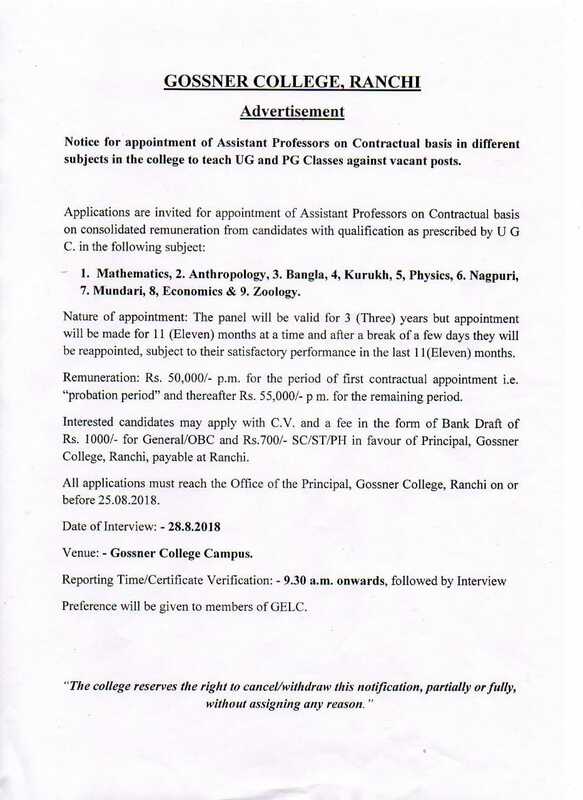 Gossner College is a Minority College, affiliated to Ranchi University and is managed by Gossner Evangelical Lutheran Church (GELC) of Chotanagpur and Assam. Our mission is to provide the vista of university education to the deserving students coming from socially, economically backward and underprivileged communities of this region, particularly the Scheduled Tribes, Scheduled Castes and other Backward Communities. Preference is given to students from these communities. However, since the college is situated in the heart of Ranchi (Jharkhand, India), students of other communities and regions may also apply. Toppers list of different Graduation (Part-3rd) 2018 Exam. Please click here for details. All students of I.A./I.COM./I.SC. (session 2017-19) Kindly Check 'Registration checklist' (link given below) and for Correction contact college Registration Department Counter No.- 05 before 24/11/2018. Checklist Of Application Forms Submitted Online For Registration Of Students Of Class Xii To Appear In Intermediate Examination, Year 2019. "Anti Ragging Squad/Committee" as per directive of U.G.C. & Hon'ble Supreme Court of India. All students are advised to contact the above mentioned to register any ragging related complaint.